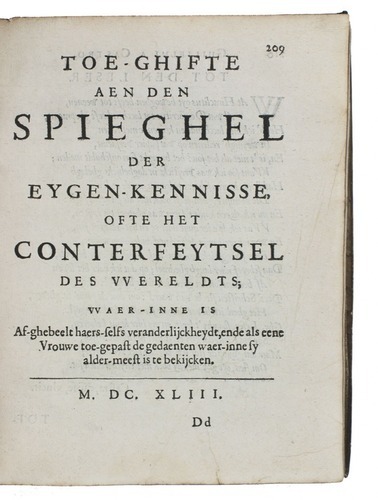 BORCHT, Willem van der (Guilielmus a CASTRO). Brussels, Lambert de Grieck, 1643. 4to. 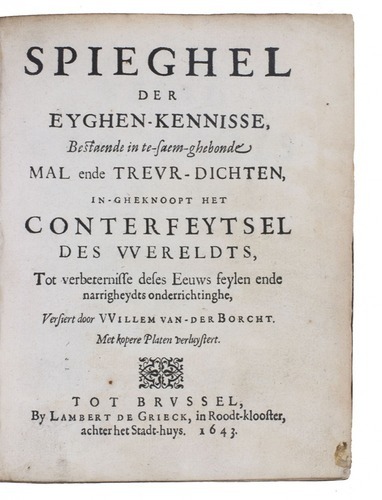 With engraved title-page, engraved portrait of the author (after P. de Backer), both by Antoine van der Does ("AVD"), and 3 nearly full-page engraved illustrations in the text, probably by Van der Does. 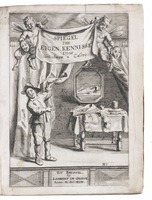 18th-century vellum. 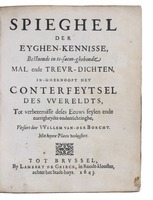 First edition, in Flemish Dutch, of a didactic satire, mostly in verse, by the Flemish poet and lawyer Willem van der Borcht or Guilelmus a Castro (1621/22-1668) in Brussels, with elegies and epigrams alternating with prose passages. It allegorically presents a mirror of self-knowledge and knowledge of the world, intended to improve the faults of the age and show the foolishness and vanity of the world. 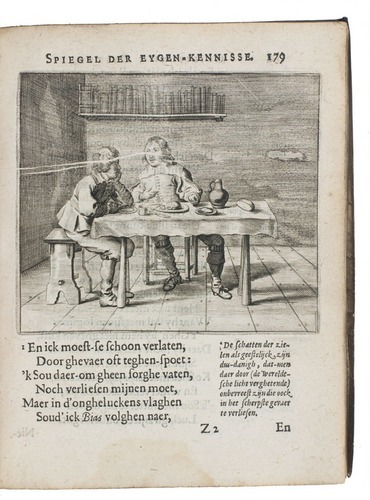 The fine plates by Antoine van der Does, showing scenes of rich and frivolous society, are of interest for the costume and morals of the time. 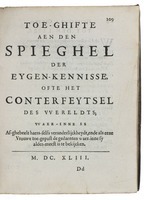 The "Toe-ghifte", an integral part of the edition, but with its own title-page on 2D1, represents the world as a capricious woman. 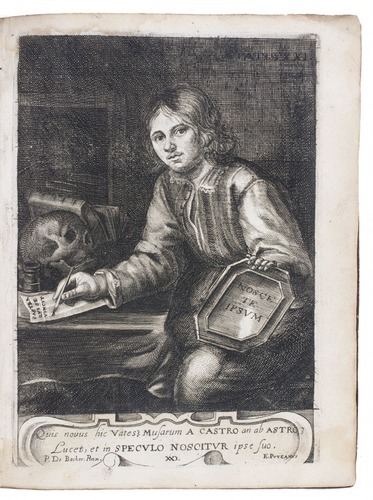 The portrait shows Van der Borcht at age 21 with the motto "nosce te ipsum", and a 2-line verse by Ericus Puteanus below. The 3 illustrations show realistic genre scenes, influenced by Rubens. Half the copies listed by the STCV lack the portrait and/or the engraved title-page. 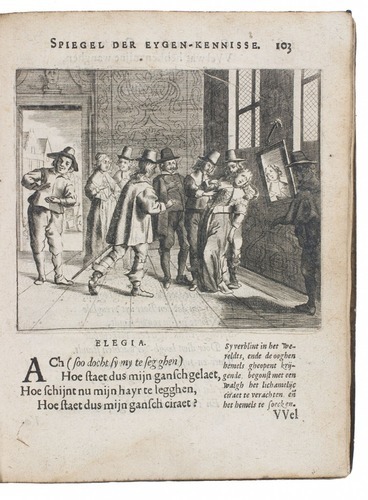 One illustration was printed over a crease in the paper, leaving a white line through part of the scene. 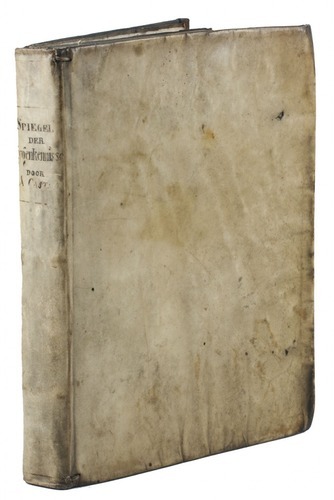 In very good condition, with a minor water stain in the head margin of the engraved title, just touching its border. Binding lacking ties, with 1 sewing support broken at the back hinge, slightly wrinkled and a bit dirty, but still good. 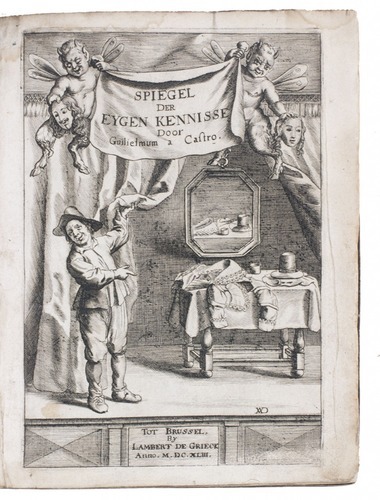 First edition of a satire of society, with plates made for it by Antoine van der Does. Bibl. Belg I, p. 319; BCNI 9630; Funck, pp. 282-283; STCV (8 copies incl. 4 incomplete).